Well, it's been yet another wild year. I've been to some great places and met some great folks. 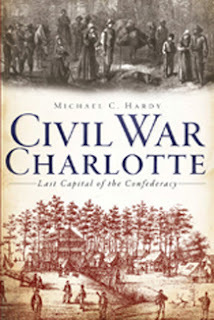 Highlights include the trip to Hanover Court House in May participating in a tour led by Robert E. L. Krick, signing books with friend Sharyn McCrumb, speaking at Fort Fisher in June, speaking and signing at the Vance Birthplace in August, signing books in Gettysburg in October, and a host of other events across the board. Thanks for making my year great! Next year is looking ever better. I'm hard at work on two new books: the first is currently entitled North Carolina Remembers Chancellorsville and will be published by Ten Roads Publishing. Like North Carolina Remembers Gettysburg, this new book on Chancellorsville will feature first-hand accounts written by Tar Heel soldiers about their experiences at the battle. A couple of the accounts were even written while the battle was still in progress. Also in the works is Watauga County and the Civil War, which is being published later this year by the History Press, the same publisher that did Civil War Charlotte. I've been working on this project for 17 years, collecting information and first-hand accounts. I'm really looking forward to this project. There are other announcements about other projects coming soon, including my paper proposal for the conference at Wake Forest later this year. 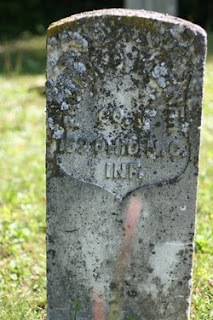 And, I plan to get back into posting the short blogs under the "Looking for NC's Civil War" title. I've really enjoyed these and I hope you have too. I'm going to dig more deeply , into my film stash, and do some scanning in the coming weeks. So, I hope you had a great year - a year in which you got to explore some piece of North Carolina's Civil War history. So I wonder, who was "OLD JOHNNY REB" from Loafer's Glory (Mitchell County, NC)? Probably served in either the 6th or 16th Regiments. Originated at Chancellorsville When Tar Heels Ran Over Virginiains. In your issue of the 18th you state that you cannot give the origin of the term "soreback" as applied to Virginities. The epithet originated at the battle of Chancellorsville May 1863. After General Jackson was wounded, Gen. J. E. B. Stewart assumed command of Jackson's corps and the next morning ordered an advance on the enemy's position. I think this was May 3d. The front line of Confederate troops were Virginians, commanded by General A., and the second line commanded by Gen. R., were Tar Heels. After advancing a short distance the enemy opened a terrific fire on the advancing Confederates which caused the Virginians to lie down and hug the ground and refuse to assault the enemy's position. General Stewart then ordered General R. to advance-"run over the Virginians and stamp them into the earth." The Tar heels obeyed the order to the letter and carried the enemy's line, and from every Tar Heel in that line who was so fortunate as to have a pair of shoes on some Virginian received a sore back. Fortunately, many of the Tar Heel boys were bare-footed and could not do as effective work as it they had been well shod, but they did the best they could. Such was the origin of the term "soreback" for Virginians. ~Charlotte Observer 24 April 1912. Co. K, 152 Ohio NC Inf. Keener is buried in the Heaton Cemetery in Avery County.